I purchased a TerraTrikeTour II in August of 2014. 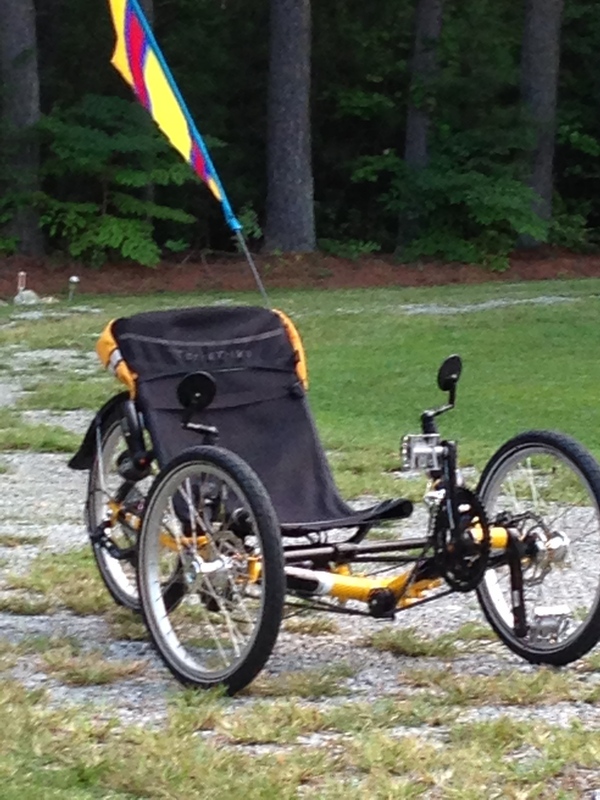 I had never ridden a recumbent trike before but because of some health issues I ordered one. I have fibromyalgia and arthritis so a traditional bike was causing me a lot of pain. My hands and arms would go numb and riding just wasn’t enjoyable for me. The recumbent trike puts you in a more natural, comfortable position. The seat is slightly reclined and your hands and arms are in a natural position down beside your body. The seat is very comfortable and no more having to wear the chamois padded bike shorts. 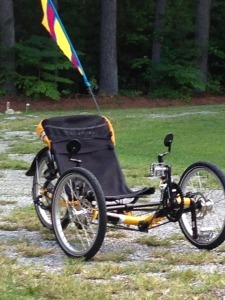 My TerraTrike Tour II is a 24 speed and is a tadpole trike. ( Tadpole is having two wheels in front and one in back. Delta is one wheel in front and two in back.) This trike is so very fun to ride and there really is no concern for balance issues. It is light enough for me to pick it up by myself and put it on my carrier. We are going on a camping trip, which we will be biking in to a camp site. All equipment and personal items will be packed in two Burley trailers. We are looking for to our adventure and will give updates upon our return.